Special display of objects excavated at the Roman forts, Dover. SPECIAL DISPLAY OF FINDS FROM ROMAN FORTS AT ROMAN PAINTED HOUSE, DOVER. Following the publication of the Roman shore-fort at Dover in 2012 (KARU Volume 11 of Kent Monograph Series) a special display of some of the outstanding Roman artefacts discovered during the rescue excavations are now on display. This display includes many of the best sculptures and other fine artefacts and is on the upper gallery of the Roman House with graphic material taken from the Dover shore-fort volume. The new display includes two stone altars. 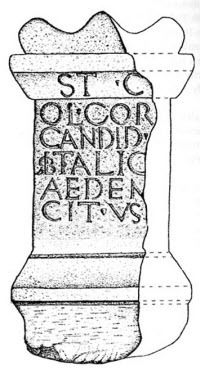 One, substantially complete, with well-cut letters, was set up by the transport officer of the consular general, Olus Cordius Candidus, to fulfil his vow. It was discovered in the rubble of the foundation-trench of the west wall of the shore-fort and originally probably stood in a shrine on the north side of the earlier Classis Britannica fort. Its date must be 2nd century. The upper half of a second substantial limestone altar, is probably dedicated to the Mother Goddesses of the province of Britannia. This was found in a late-Roman soil deposit in the cut terrace of the south-west corner of the shore-fort and again relates to the earlier Classis Britannica fort. 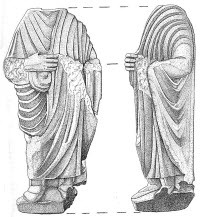 A really fine sculpture is the splendid, but headless, statue of a third life-size Roman wearing a full toga. A second is the damaged head (not belonging to the toga statue) probably from a life-size statue of an elderly man with a beard. It is suggested this could be Neptune, which would be very appropriate as the Classis Britannica had its base in Dover. 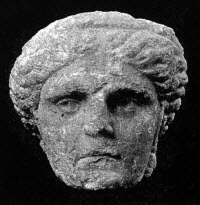 Another really fine head, this one of marble, is the diademed head of a woman, perhaps, it has been suggested, of the Empress Sabina, consort of the Emperor Hadrian or of a woman who copied Sabina's hairstyle. It might have been set in an alcove in a wall and have been used as a shrine during the Classis Britannica period. Part of a well-cut inscription is also on display. The fragment consists of just parts of two lines, with faint traces of red paint in the letters. 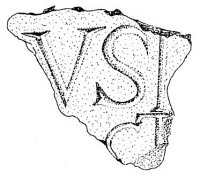 The upper three letters (VSI) is unusual and the lower sT suggests a Classis Britannica link. It is suggested this piece was part of a monumental dedication inscription. An interesting decorated limestone cornice can be viewed and is one of several architectural fragments found in late-Roman rubble. This was described by the late Dr Tom Blagg of the University of Kent in the Dover shore-fort volume and shows part of a row of serrated leaves, separated by a small calyx or stem and is uncommon in Roman Britain. It is well worth making a visit to the Roman Painted House at Dover just to see these and several other amazing pieces in this special display! (For opening hours of the Dover Roman House and details of the Dover shore-fort volume see elsewhere on this website).